Today’s Gospel reading (John 17:1-13) takes us back to the upper room, where Jesus had his last supper with the disciples before his arrest. On this Sunday After Ascension, one week before Pentecost, we hear Jesus speak of returning to where he was, with God his father, from all eternity. 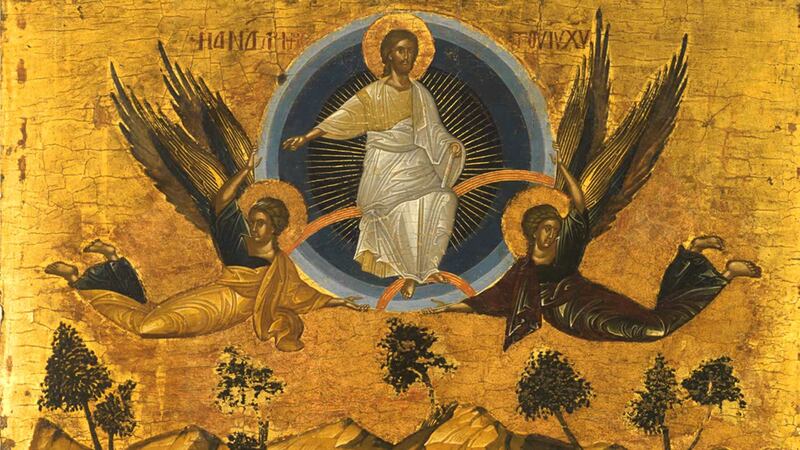 This is what Ascension is all about: the return of Christ to the right hand of God the Father. In this prayer, Jesus refers to the authority that God the Father has given him “over all flesh” and “to give eternal life.” As if that was not enough, Jesus here asks his father to glorify him with the glory that he had from before the creation of the world – “in your own presence”! So in these few sentences, Jesus claims authority to grant eternal life; he claims to share God’s glory, in the presence of God (=with God); and he claims to have existed with God before anything was created. Those are radical, bold statements for anyone to make within the strict monotheistic culture of Judaism. But John’s Gospel has already claimed these truths – for example: “In the beginning was the Word, and the Word was with God, and the Word was God. He was in the beginning with God; all things were made through him, and without him was not anything made that was made. In him was life, and the life was the light of men” (John 1:1-4); “Abraham rejoiced that he was to see my day; he saw it and was glad… Truly, truly, I say to you, before Abraham was, I am” (John 8:56-58); “For as the Father has life in himself, so he has granted the Son also to have life in himself, and has given him authority to execute judgment, because he is the Son of man” (John 5:26-27); and one can go on and add other passages. Note that the old Greek translation (LXX) regards the “one like a son of man” and the “ancient of days” as one and the same person. 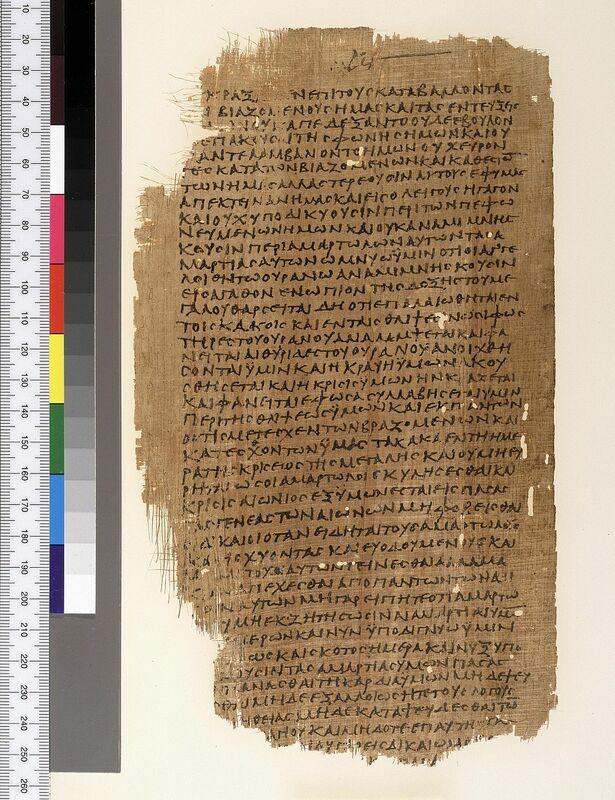 A later Greek translation, by Theodotion, separates the two, in a more accurate translation of the Hebrew text: ἐθεώρουν ἐν ὁράματι τῆς νυκτὸς καὶ ἰδοὺ μετὰ τῶν νεφελῶν τοῦ οὐρανοῦ ὡς υἱὸς ἀνθρώπου ἐρχόμενος ἦν καὶ ἕως τοῦ παλαιοῦ τῶν ἡμερῶν ἔφθασεν καὶ ἐνώπιον αὐτοῦ προσηνέχθη. Does the LXX version perhaps represent some confusion over the language of Daniel and an intentional effort to avoid giving divine attributes to this “son of man”? And did Theodotion remain more faithful to the Hebrew original? It’s also interesting that the Dead Sea Scrolls include many manuscripts with portions of the book of Daniel, but the two verses of the “son of man” (7:13-14) are not found in any of these manuscripts and fragments among the Dead Sea Scrolls! This intrigues me, but I have no explanation, except perhaps to speculate that Daniel’s vision of “one like a son of man” had become controversial in the time immediately before the appearance of Jesus. The Book of Enoch (generally referred to as 1 Enoch) is another book that was compiled in the century before Jesus; but unlike the Book of Daniel, it was never included in the Bible – though it is significant that the New Testament book of Jude directly quotes it! It was of these also that Enoch in the seventh generation from Adam prophesied, saying, “Behold, the Lord came with his holy myriads, to execute judgment on all, and to convict all the ungodly of all their deeds of ungodliness which they have committed in such an ungodly way, and of all the harsh things which ungodly sinners have spoken against him” (Jude, verses 14-15). Who was Enoch? In Genesis chapter 5 we read: Thus all the days of Enoch were 365 years. Enoch walked with God, and he was not, for God took him. This statement that “God took him” fascinated the Jews for centuries, and it was inevitable that a book would be put together claiming to represent what was revealed to Enoch after he was taken to heaven. This book of Enoch is one of the many books that are called Pseudepigrapha – books that were not written by the individuals that they claimed to be written by. There are countless such books from the Old Testament times and also from the New Testament times and the early centuries of the church. The section of 1 Enoch known as the Book of Parables was written around time of Jesus or a little earlier and contains many visions of the Son of man. Here are some excerpts. The parts highlighted in red are meant to emphasize the similarities with Daniel 7 and the words of Jesus. 1 Enoch 46: In that place I saw the One to whom belongs the beginning of days, whose head was like white wool. With him there was another individual, whose face was like that of a man, and whose face was full of grace like that of one of the holy angels… This is the Son of Man, to whom belongs righteousness… he is the one whom the Lord of Spirits has chosen… This Son of Man whom you have seen is the One who will remove the kings and the mighty from their seats and the strong ones from their thrones. 1 Enoch 47-48: In those days, I saw the Beginning of Days sitting upon the throne of his glory. The books of the living ones were open before him, and all his army of heaven above and his council stood before him… At that hour, that Son of Man was called into the presence of the Lord of Spirits. His name was in the presence of the Beginning of Days, even before the creation of the sun and of the stars… He is a support for the righteous ones… He is the light of the gentiles and the hope of those who suffer in their hearts. All those who dwell upon the earth shall fall and worship him… For this purpose he was chosen and hidden in the presence of the Lord of Spirits prior to the creation of the world, and he will remain for eternity… And on the day of their distress there will be rest upon the earth, and before them they will fall and not rise, and there will be no one to take them with his hand and raise them. For they have denied the Lord of Spirits and his Anointed One [Messiah]. Blessed be the name of the Lord of Spirits. 1 Enoch 62: And the Lord of Spirits <seated him> upon the throne of his glory; and the spirit of righteousness was poured upon him… And there will stand up on that day all the kings and the mighty and the exalted and those who possess the land. And they will see and recognize that he sits on the throne of his glory; and righteousness is judged in his presence, and no lying word is spoken in his presence… And one group of them will look at the other; and they will be terrified and will cast down their faces, and pain will seize them when they see that Son of Man sitting on the throne of his glory. And the kings and the mighty and all who possess the land will bless and glorify and exalt him who rules over all, who was hidden. For from the beginning the Son of Man was hidden, and the Most High preserved him in the presence of his might, and he revealed him to the chosen. And the congregation of the chosen and holy will be sown; and all the chosen will stand in his presence on that day. These are remarkable statements, and this book of Enoch has become a focus of much scholarly research in recent decades, precisely because it sheds so much light on Jesus and how he understood himself. These passages from 1 Enoch could very well have been part of the New Testament! So what do we learn from these excursions into the Judaism that Jesus was born into? Clearly the visions of the “son of man” that we find in Daniel and 1 Enoch had become part of the conversation among Jews in the century immediately before Jesus. Perhaps the absence of Daniel 7:13-14 and the intentional change in the Septuagint translation reflect concern that these verses were a danger to strict monotheistic religion; perhaps they echoed memories of mythological beliefs that some mainstream and sectarian Jews preferred to leave buried in the dust. Perhaps that is why 1 Enoch remained a book in the margins of Jewish society and religion. One can go on speculating. The Emperor Constantine seated at the head of the bishops at Nicaea. The condemned Arius is crouching at the bottom! Indeed, who is this Son of man? To ask that question is to go deep into the mystery of Jesus. Some people say that Christian theology is too complicated and philosophical, with all our talk of Trinity and the two natures of Christ, etc. 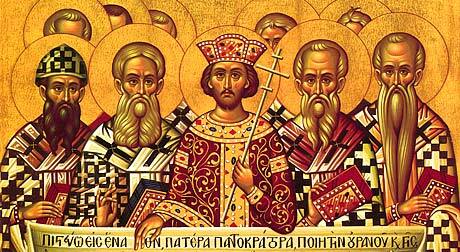 We honor the seven Ecumenical Councils that gave us our fundamental doctrines. 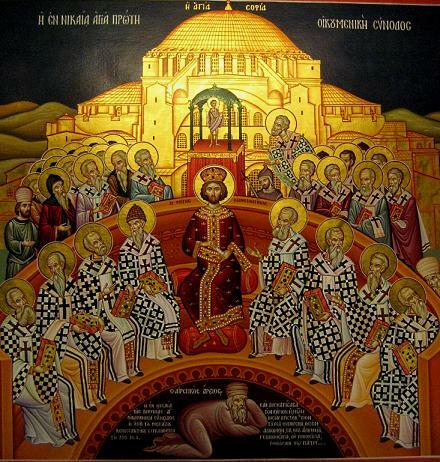 Today we honor the 318 Fathers of the Council of Nicaea in the year 325. They thought they had God all worked out. They didn’t even come close; all they did was satisfy the emperor’s desire for unity and peace. To talk of Trinity and to recite the Nicene Creed is only the beginning. There are depths that no theology can plumb – which is why in the Orthodox tradition we have the apophatic approach, which is the way of unknowing, the admission that regardless of what we can say about God the reality is much greater, much beyond our understanding. My first explorations in this question of the Son of man tells me that Jesus was far more mysterious, far more unique, than even our Nicene and Chalcedonian theologies will ever tell us. Let us humbly admit that our theologies are only markers on the road to union with God in Christ. Categories: Biblical Explorations | Tags: apophatic theology, Ascension, Book of Daniel, Book of Enoch, Council of Nicaea, pseudepigrapha, Son of man | Permalink. Thanks for this splendid and informative commentary on the Son of Man. The point about the LXX translation is new to me, and full of interest. I also agree with your concluding point that our images of Jesus need constant refreshment and expansion, so that they remain challenges to faith rather than pointers to dogma. I might mention two Opinions about the Son of Man from a sceptical Jewish friend. Firstly why do so many Christain commentators ignore Ezekiel who is called by that name in his prophecies? And secondly, remember that all mystical images in Judaism that don’t refer to God, refer to Israel. I think Jesus may have intended a communal interpretation. Very important points from your Jewish friend, and very much to the point. I did ignore Ezekiel, simply because I wasn’t ready to do an exhaustive discussion. I just wanted to focus on Enoch and Daniel as being more directly related to the church’s understanding of Son of Man. Notice I said, the church’s understanding. Jesus’ own understanding could very well have been much less apocalyptic, more along the lines of Ezekiel and the communal meaning which was very much the Jewish understanding. The same of course could be – and should be – said about Isaiah’s “servant” and practically every passage in Isaiah that the church and the NT writers took as prophecies of Jesus. We (=NT writers and the church) have definitely not been completely honest with our sources!